Why Change Your Business Name on TripAdvisor? According to industry research, travel website TripAdvisor ranks ahead of personal recommendations, tourist board websites, and guidebooks as the most trusted source for travel planning. If your business is listed on the site, you have to put your best foot forward by updating your business name, listing, location, category and other details. Having the correct information displayed on your TripAdvisor business listing will help improve your engagement levels as well as prevent potential customers from getting confused. There are situations in which you may feel like you have to change your business name on TripAdvisor. You may have undergone a rebrand. Or you moved to a new location, with which a name change is necessary. Or maybe your listed name was incorrect to begin with and you need to update it. The first step to changing or updating your business name is to make sure you have already registered to access the TripAdvisor Management Center. 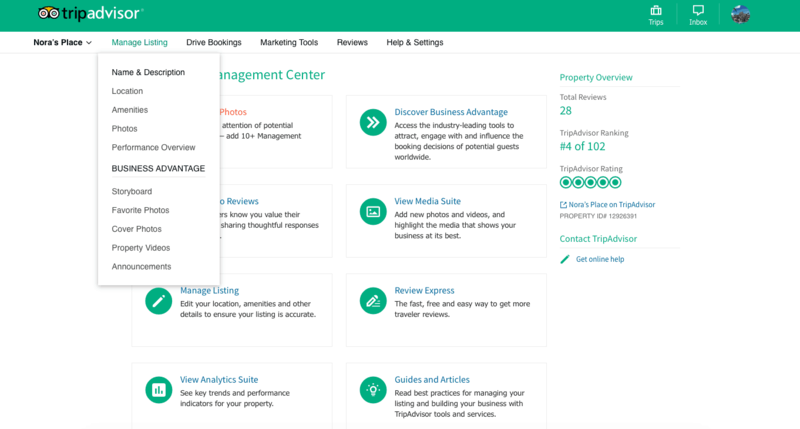 Once you have registered and verified your business, you’ll be able to log into the Management Center by visiting: https://www.tripadvisor.com/Owners. Use the menu on the left-hand side of the page to change the business name**, or edit each relevant section of the listing (like location and amenities). If you represent a hotel and you are changing your business name on TripAdvisor, you have the option of selecting a specific hotel brand as well as a specific business name. Hit “Submit” when you’re done. ** Keep in mind that TripAdvisor may translate your business name into other languages in order to display it in all points of sale. Select “Request change of accommodation type” and fill out the form. Make sure you also provide TripAdvisor with links or license information that the site can use to verify your requested category change. In the “Attraction Details” section on the left, update all necessary sections. I just submit my business but i realize that the description does’t fit. My office organize photography workshop holidays in different places in Greece. I categorized my business as an attraction (lessons/workshops) and i had to register in one permanent place where my office is and not actually our places of activity. Should i wait first the acceptance of my submission and then change it? and how can i include the 5 photography destinations? Yes, please, we recommend you wait for your listing to be approved and verified before you make the corrections and other further change. Let us know how it goes! Any can help me please if you kindly help. Because totally I was boring to trying listing my company on TripAdvisor site and never I see on trip advisor . My company espesialis for boat trip actually . My name is Atta and I is the manager of company. My location on the map is incorrect and people and telling me they cant find my club due to it. The address is correct but the map shows wrong!!! Now I have been penalized for making a comment on my page, who is going to now compensate me for loss of income due to your error? If you made updates or changes, typically you’d have to wait a few business days for those to take effect. Please contact TripAdvisor or visit the site’s Help Center for any further problems or concerns with your listing. Let us know how it goes! I would like to leave an I Pad in my new visitor centre to allow visitors to post their comments on Trip Advisor themselves whilst here. It is always the disgruntled visitors who got pecked by a rare duck that post a miserable review or find they have to pay when they wanted to go out free and so the thousands of visitors who come yearly go home happy and return often don’t bother to review us but if it was here in the centre they could post their reviews over a coffee and we could get the benefit of this. Can you tell me if this is possible to do and if so how can it be done? I have been trying endlessly to switch my business from an attraction to a restaurant and I cannot get anything to work. Please help! I NEED TO CHANGE MY TYPE OF BUSINESS IT IS LISTING ON VACATION RENTALS BUT IT HAVE TO BE ON ATTRACTION SO THAT HOW CAN I CHANGE IT. PLEASE LET ME KNOW. Hello, My business is Coastal River Charters a Fishing & Sightseeing Company in Savannah, Ga.. The business is fishing. Can my listing be under charters & fishing rather tours? Hi Jack, you can certainly try it out! “Fishing charters and tours” sounds like your ideal category. Let us know how it goes! Hi, I want to change my property listing from B&B to hotels. How can I do it ? Actually I have lost my login details. How can I retrive the same and make needful changes. I too listed my hotel in the category of guest house, I have the login details and would like to change it. Couldn’t do it myself. A quick help would be really appreciated. I operate a tour company. We provide tour services to two different Cities. I have on,y been able to list in one of the Cities. Is there any way that my tour company can show up on “Things to do” search in both cities ?